Hairy Bikers | what? bread? 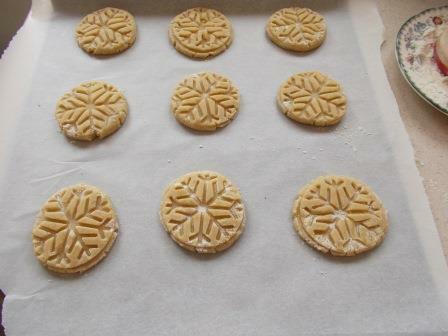 Making biscuits with patterns on top is an ancient art. There’s a lovely blog about it from Ivan Day, who owns some beautiful historic biscuit stamps. Me, I bought one in M&S last week. I’m stuck at home with a sprained ankle this morning so I thought I’d try it out with the Hairy Bikers Cardamom and Lemon cookies. I only made half a batch as I didn’t have enough almonds, and I had to plump up the portions to 30g pieces to make the stamp work. I weighed the pieces, rolled them into balls and pressed them flat with my hand before using the stamp. 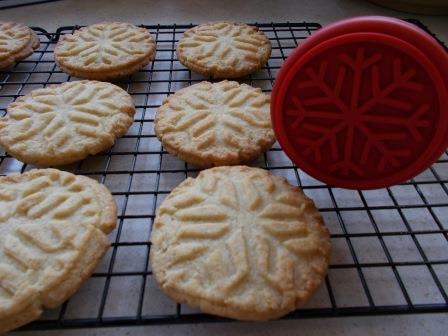 The stamp is probably a bit too ornate and I had to use plain flour to coat it before stamping out the cookies. Now I have something to eat with my morning coffee. Before and after pictures below. A dinner-time treat to follow down some home-made pizza, the base being Dan’s recipe from Short and Sweet. I like mine thin so make a half quantity for three pizzas and roll them out quite thinly. I also try to use the 00 flour that the recipe calls for. No pictures I’m afraid! So, cheesecake. From the Hairy Bikers Bakeation in Italy – first make your amaretti biscuits – egg white, sugar, almond extract and ground almonds, then make the cheesecake topping – ricotta cheese, caster sugar, eggs, double cream, lemon zest and amaretto liqueur. I’d had my eye on this one for a while, partly because it is gluten-free and our niece is that way inclined so if we entertain her we try to include treats she can eat. Normally with cheesecake for her I’d use the GF digestive biscuits from Sainsbury, but this is a way of making a cheesecake without involving any flour. So, equipped with a bottle of amaretto bought this week on offer from that supermarket already named I was ready. Given that there’s only two adults and our son is mightily suspicious of everything I bake and thinks a wiff of alcohol will make him drunk (one day I’ll remind him about ‘quaffing’ Bucks Fizz at a Christening when he wasn’t out of nappies but not today), I opted to make only a three quarters sized cake on the basis that it ought to do 5 to 7 portions and keep the two of us going over the weekend. Results – acceptable, a bit on the egg-custard side of cheesecake to be utterly perfect, but as I used the yolk from the egg used for the amaretti biscuits and three whole eggs, that might be why. However, the worst part was that while it was cooling in the oven it leaked out about 50ml of sweet juicy stuff which seemed to contain most of the amaretto. I saved most of this ‘juice’ and used it with some sliced strawberries which I left to marinate in caster sugar while the cake cooled. I don’t expect there to be much of this left by Monday. I have biked about 12 miles today, 7.5 with the offspring on his new road bike, so felt I’d just about earned it. And now I’m equipped with the amaretto, there’s some other recipes in that book that will require my attention. Easy peasy lovely Hairy Biker’s recipe from the Bakeation Austrian episode. Deviations – not enough soft butter so I used 50g marg + 100g butter, medium eggs, not large ones which made it a little stiff, I suppose I could have added milk, but got away with it more or less. I found a bundt tin in T K Maxx at the weekend so it isn’t in a proper gugelhopf ring, so it is a bit more rounded than the Bikers’ one. The recipe says it serves 10, but it is enormously rich so I think this should only be served in teeny tiny bits, but good for carb loading before running! I don’t think I let the icing thicken enough, but that’s just ‘cos I was impatient. I have another recipe with this kind of topping and it takes forever if you let the chocolate get too hot at the start, so I try to err on the side of caution and take it off the heat before all the chocolate is melted. After making the breadsticks with rosemary the other day I came across a Hairy Bikers recipe which I don’t think they demonstrated or filmed someone making in the recent Bakeation tv series, but which sounded nice because it include fresh rosemary, fresh thyme and some fennel seeds (of which I have lots after the cherry and fennel loaf last month). Some bread authorities aren’t that keen on adding herbs and ‘flavours’ to bread, but sometimes I like them. So then what have we got in it? 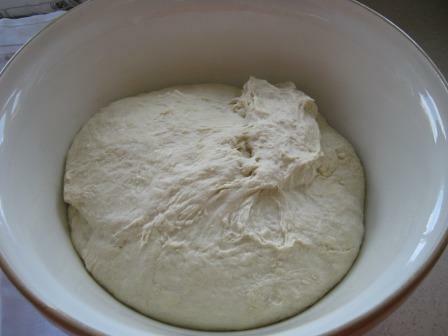 A starter dough that includes yeast, white flour, rye flour and water – note that the recipe makes a double quantity – a lesson to me to read the recipe all the way through because I would have only made a half quanitity as this was a first go at it. However, it says the unused starter can be frozen so I have done that. This is supposed to be left in the fridge for 24 hours, but I couldn’t wait that long and left it for about 6 hours in the kitchen. For the bread you need to add more yeast, salt, white flour, water and chopped fresh thyme leaves, rosemary leaves and some lightly toasted fennel seeds. Nothing complicated here, kneading for 10 mins, leaving for an hour the knocking down and combining in the herbs and seeds then and leaving for another hour, flouring, slashing and baking. It went off like a rocket in the oven and the top and sides split, but it makes an attractive enough loaf I think. I will be having this for tea with cheese I think. As viewers of the Hairy Bikers Bakeation will know, the first programme in the series was set in Norway. And for me so far, has provided the most useful recipes in the accompanying book. The book has more recipes in than they show in the series, which is good, but the recipe that it doesn’t have for Norway was the one that looked the most interesting to me when I watched the programme, skillingsbollar baked by Morten Schakenda at his bakery in Lom. On the TV show you can see the amazing view the bakers have out of a picture window over the river and the wood fired ovens they use. Today we had pouring rain so it was a bit like that here (not really!) but I don’t have a wood fired oven. So to find a recipe I trawled the ‘net and found this recipe by an American lady called Marion who lives in Norway and who seems to know her buns! Morten’s book seems only to be available in Norwegian but this recipe has all you need to know. So – ingredients are flour, milk, sugar,yeast, salt, cardamom, egg, butter, cinnamon and sugar mixed up. The cardamom goes into the dough – a secret Norwegian ingredient. And I’ve added some sultanas. And there’s an eggy wash on the top. Just as well the bikers have announced a series about dieting! I’ve been out supporting runners in the Milton Keynes marathon this morning, and I think I deserve a treat now! Nearly as much as the competitors did. And after I’ve done with all this, perhaps I go for a little run myself, if it ever stops raining, every time I look out, it’s at it again. 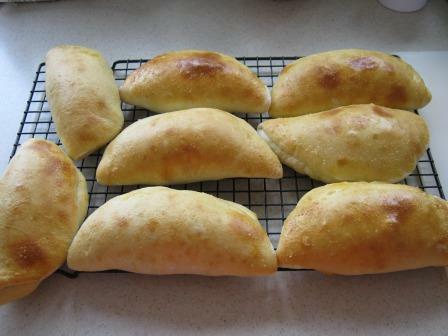 Not bread as such but made with dough rather than pastry. 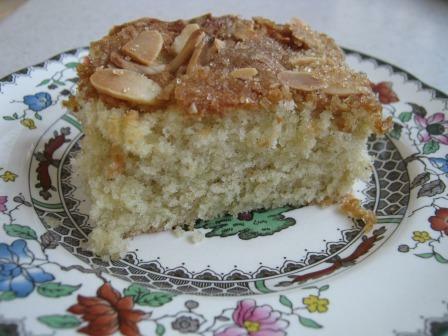 As appeared on the Hairy Bikers Bakeation episode from Norway, and the recipe can be downloaded from here. 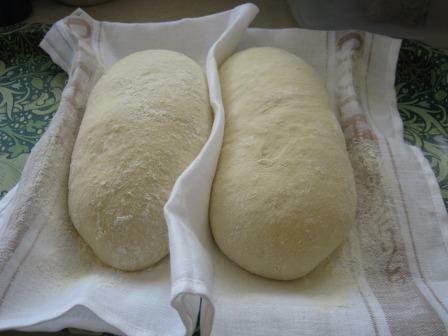 The dough is made from water, sugar, yeast, four, milk, salt, butter and eggs. However, the recipe makes a lot and I have had a most traumatic time trying to work this into something edible. 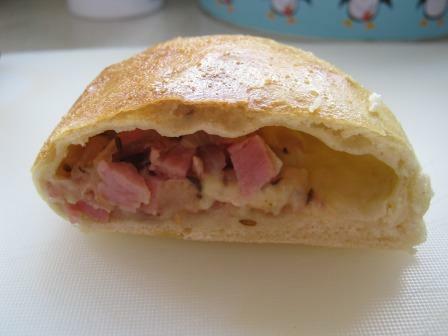 The filling is onion, garlic, ham, cheese, parsley, caraway seeds and salt and pepper to taste, nothing to complain about with that, except the amount is nothing near enough to fill the amount of dough that appears. I should have only made half the dough and I think even that will be too much. I’d need to watch how much extra liquid went in more carefully, perhaps starting with half the milk and then trying to form the dough. 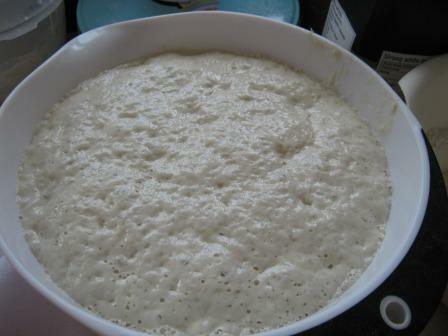 So, the dough is made by the sponge method and you leave water sugar and yeast for a couple of hours to do its thing. Note that it has filled my bowl after just about 2 hours. 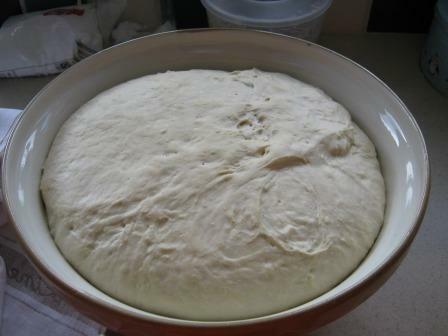 Then you add the rest of the ingredients and make a firm dough, well, if I’d tried to knead it, it would have been off the worktop and all over the floor before you could say ‘watch that dough’. I added a lot of extra flour just to get it into something that be handled and nowhere near anything that could be described as firm. Then I had to go out for a bit and when I came back it had filled the bigger bowl I’d left it in. When I got back I divided some of the dough into 90g pieces, I made 12 on the off chance that there would be enough filling to fill them. I rolled the balls with a rolling pin and put in the filling, slapped on some beaten egg to join the edges and then over the top and flung them in the oven. I made 9, there’s pictures of 8 but I’ve already eaten one! They took about 20 mins to cook and puffed up nicely. and saved some for pizza bases for when the family come back later on. 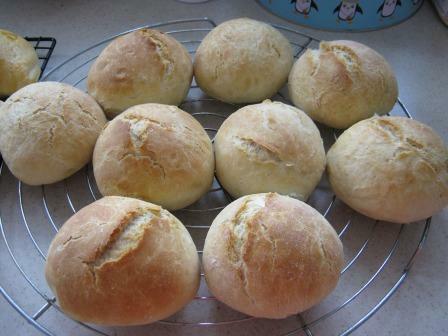 Not sure if I’d make them again, but they are quite tasty and I’ll have another one later with some salad for tea. My aunt has not been well. And we’re off to see her and my cousin and my cousin’s son tomorrow. We’ve been to visit several times over the last few months and I take some baked goodies along too. Initially to give her something tempting to eat because she needed building up, but now perhaps to help me feel like I’m doing something to help. I don’t know if it does, but it makes me feel better and gives us something to talk about. So today I have baked these Little Stem Ginger Gingerbreads from The Great British Bake Off How to Bake book. The book does not have a decoration on them but I added some water icing made with lemon juice and some pieces of stem ginger rolled in granulated sugar. 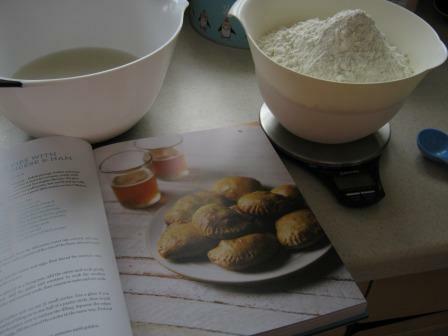 Next up are these Norwegian cardamom and lemon stamped cookies from the Hairy Bikers Big Book of Baking. I weigh the mixture into 20g pieces and while I don’t have a cookies stamp I use the bottom of a little plastic pot. I make about 30 of them, rather than the 24 the book says. These smell fantastic while they are baking and taste rich and buttery as well has spicy from the cardamom. 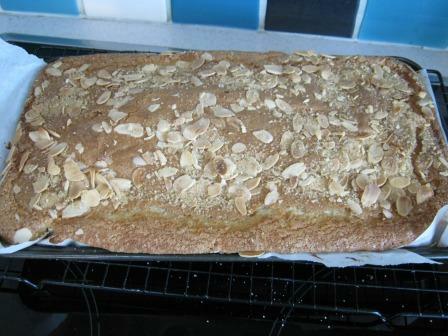 And finally while all that was going on I was making my first Mellow Bakers loaf – a Quick White Loaf with millet flakes. 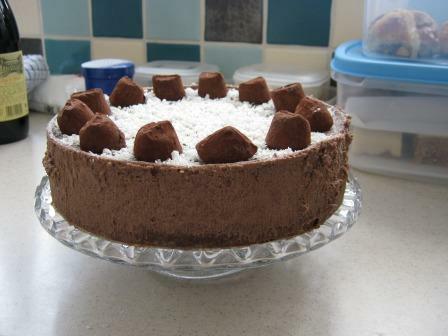 Hairy Bikers Belgian chocolate truffle recipe doesn’t involve a lot of baking! But I’m so looking forward to some of this…..
Here’s what I have been doing this afternoon – starting with two loaves for Monday and Tuesday’s breakfasts and lunches. 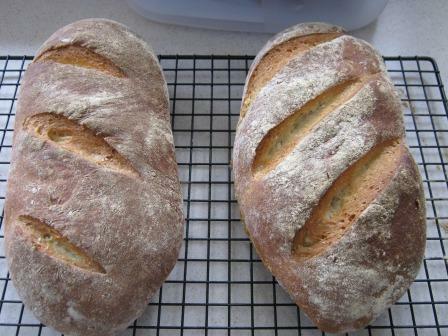 This is based on Dan Lepard’s wholemeal loaf, but with some white flour to lighten the loaf. 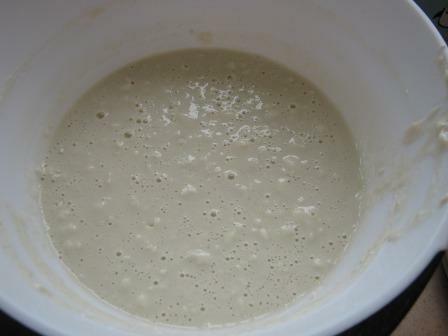 The ingredients are: water, yeast, sugar, salt, wholemeal and white flours, and some sunflower oil. While I was doing that I also made Dan’s hot cross buns from this week’s Guardian magazine. I made 15 rather than the advertised 12, and didn’t put the crosses on. Very yummy! 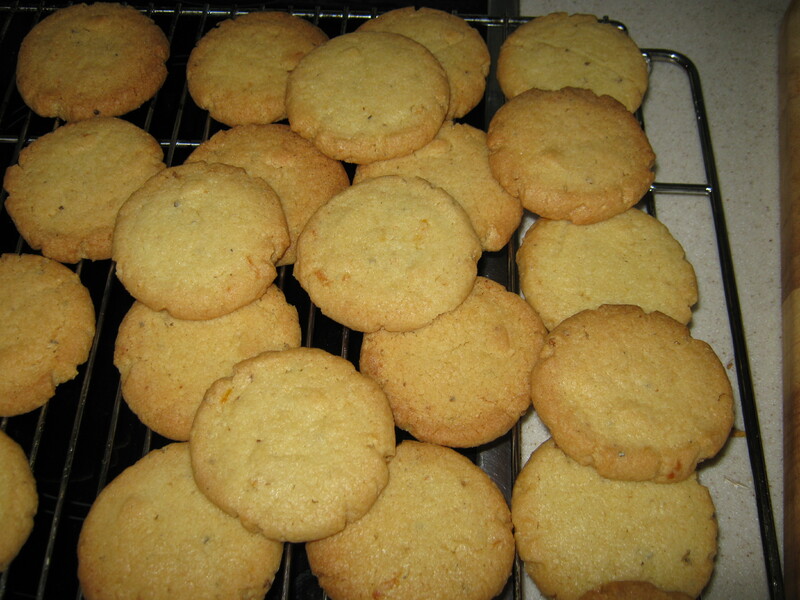 And after that I put in a batch of Hairy Biker’s Norwegian cardamom and lemon cookies. Only the final result for them, you can watch how to do it on the BBC website.